ULTRA SLIM DESIGN: This Fitbit Versa case fits like a glove and mimics the Fitbit Versa design. For 12 months after the date of purchase, we take care of all quality-related issues with a replacement or refund. Click "Add to Cart" above and get your Fitbit versa case Today! 1.New Design: We updated design, You do not need to take off your watch band when it is charging, just take off this case, very easy and convenient .Precise cutouts on your Fitbit Versa without affecting the band insertion or watch charging as well. 2. MATERIAL: Soft TPU, slim and lightweight. 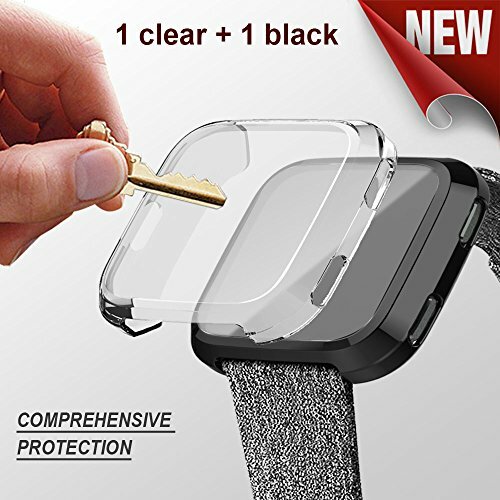 protect your watch from scratching and droping.Small dots on the screen protector designed to prevent water marks, also barely notice expect under the sunlight. 3.APPLICATION: Design for fitbit versa. very easy to put on and take off. Soft TPU plated case with built-in screen protector prevents your watch from dust, fingerprints and scratches. 4.Full Protection:All around protection design keeps the watch screen and four sides away from scratches and damages. Precise hole cutouts make it easy access to all buttons. Lightweight and slim case fits smoothly on your Fitbit Versa smartwatch. 5.Notes:Please take off the case when you need to charge It will cause moisture underneath the screen protector after wearing it at gym or sports activities, please use a dry cloth to clean also it will impact touch sensibility. If you have any questions about this product by DouDou, contact us by completing and submitting the form below. If you are looking for a specif part number, please include it with your message.